The Wireless VisionBoard is a wireless large print, large key, computer keyboard. Large, high visibility keys offer improved readability and control. ChesterCreek's big key VisionBoard computer keyboards have gone wireless!! Enjoy the added convenience of wireless technology with the only keyboard of its kind. With two models available with either white lettering on black keys or black lettering on white keys. 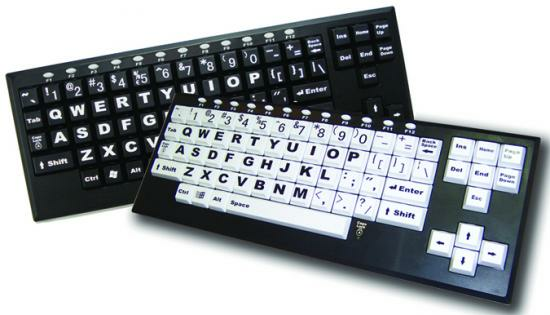 The Wireless VisionBoard large print computer keyboard offers a big advantage to people who find it painful or difficult to use a traditional keyboard, with applications in such places as assistive living communities, manufacturing facilities, special educational institutions, adult daycare and home use. The large key Wireless VisionBoard with large print, improves readability and reduces eyestrain with big 1" square keys and large, bold black-on-white letters and numbers. Users with low vision or functional limitations can increase and improve capabilities with greater comfort and control.